The very 1st post below – entitled “Waste police time to harass and defraud LA2 26 April 2018“] emphasises a typical fraud whereby a questionable character posed as a solicitor acting for Lancashire County Council at one of Carol Wood’s court hearings. The woman really worked in a bar, and not a lot more. 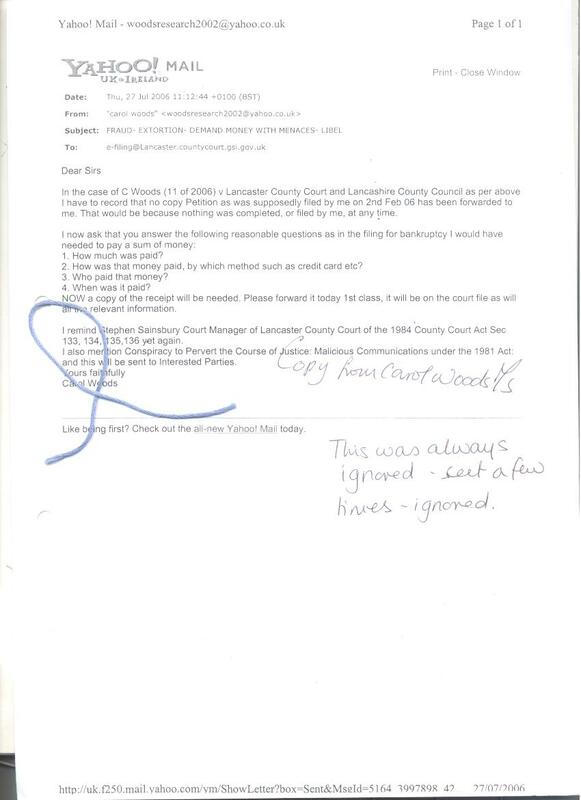 More recent updates from Carol follow, after the “Preface” directly below which attempts to form some of the overall background to why Ms. Carol Woods continues to be targeted so badly by numerous Lancashire government agencies – including, it must be emphasised – the Lancashire police force, who have been notified so many times regarding, for example, the serious multi-ID frauds committed using Carol Woods name, in whichever guise or spelling, yet do nothing to sort out the now infinite number of crimes committed along with other serious crimes connected to Carol, including numerous murder attempts on her, which include trying to blow up the caravan she was living in by the culprit creating a gas leak into the caravan from the caravan’s internal gas pipes in an attempt to blow it up – along with Carol. This attempt obviously failed, but other equally serious murder attempts have occurred over the years, including local yobs ramming Carol’s car at speed on a dual carriageway close to Carol’s home. The monetary value of the said ID frauds must run now into hundreds of thousands of GB pounds – all at the UK taxpayers expense. Carol Wood’s ID has been gleaned so many times from, it is very strongly alleged, deliberately misdelivered Royal Mail meant for Carol, misdelivered to criminal neighbours who, amongst other felons involved in the overall targeting, reap the illgotten gains of these fraudulently obtained ID frauds in one form or other – one form being receiving goods, including cars. Cars are driven by local yobs when stalking Carol in her car [which has a GPS tracking device in it placed there by an Oldham garage under instructions from, it is very strongly alleged – Lancs. police. Please see the posts on this tracking device which manages to be exempt from Data Protection Act laws, and also E.C.H.R. Article 8 rules [the right to a “private and family life, his home and his correspondence”] – how many cars have been “given” to these criminals so as they can harass – and even attempt to kill – Carol when she has been out driving her car? The posts here, copied from Ms. Wood’s communications show the outrageous hostilities happening to her which continue very much to this day – the archive made of scores of posts beginning in Febuary 2016 after certain “supporters” found out Carol had been placed in a closed mental hospital unit for the 5th [at least] time for no honest reason. On January 31st Carol was arrested by Lancs. police for being myself – the owner of this site – for allegedly posting articles here – a nonsense charge easily contradicted by my affadavit / statement as sent to Lancs. police [the statement can be seen in the recent related post put here recently], but nevertheless this unwarranted arrest causing unnecessary hassle and more grief for Carol – the point of the exercise, I for one very strongly allege. Carol has been falsely convicted in the past on most fake of charges. Sirs this reports more wasted police time; yesterday I Ms Carol Woods returned to 28 Fell View LA2 9RP and found that lowlife with loud mouths as usual had been organised for my return. They included the thief and fraudster MILLS aka STAIG from 20 Fell View who was to be with strangers and small children and hope that their shouting provoked me to take a photo so that they could scream they had WITNESSES to my taking photos of children. I ignored them but note the use of children yet again. I saw the squad car parked in the lay-by presumably waiting to rush for a call out to such a serious crime. I take this chance to report MILLS for PERJURY as well as JARVIS in 41 Fell View and DALTON in 45 which we know of. MILLS claimed from 2015 that I took photos of her and her family which included one child at least. In that she was to stand outside me in 28 with a pushchair and toddler and stand for almost an hour prior to your plan to arrest me on 7/11/15 for among other things “taking photos of children”. I ignored her: obviously JARVIS was to be the “witness”. I note the USE of your thugs, thieves, child abusers, fraudsters, bullying unemployed lowlife who are to be “witnesses” in “crimes” they claim they see me commit. I take this chance to record the use of yet another old woman to aid and abet Jackson in 26 Fell View and the lunacy that she has an identical twin so is really me as one of them. TWIN means TWO: I now have excellent photos of FIVE old woman used to be the TWIN so, someone pulls the wool over your eyes, I think. Please ask if you want the photos of her “twins”, all five of them.I report the troll stalker in blue Peugeot (smoker and phone user to pretend whatever her delusions allow) who had to have been “arranged” in ML03 JZW. I have had no response to my formal complaint sent in after the events of Saturday last. Can I add that DPD and Parcel Force deliveries yesterday plus the delivery to Jarvis in 41 plus the 3 today to 37, 11 and one other always follow from loft noises linked to me in 28 so we have clearly FRAUD on going. The TREASON linked is because BANK MAIL as virtually admitted by HSBC Lancaster branch will go to such as MILLS in 20 Fell View who we now seem to think is me as unemployed, unemployable, overweight and dishonest and using a silver Clio NY54 RZN which woman is NOT MILLS and would not be mistaken for her and MILLS has a sister, older and no “identical twin”. Bleasdale of 2 Hall Drive off Fell View must know that this is April 2018 and NOT June 2014 when he pretended to drop off “someone” (invisible) collected from south of Lancaster to rent the caravan dumped on the front of 20 as then I was Mrs Invisible and apparently aunt to MILLS and rented that squalid eyesore. I attach here photos of more times I have moved, recently apparently from Manchester via taxi except the photo taken from inside my car suggests I deal with the lunatics the garage in Oldham told me I dealt with in Jan 2012 as I bought my car. Now on record, Carol Woods Ms MY HOUSE KEYS AWAITED. 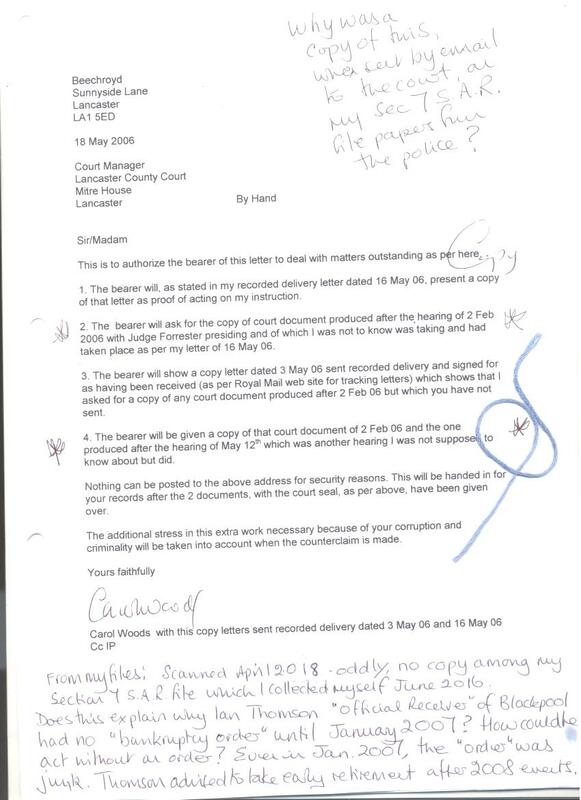 This series of documents is from Carol Woods Ms under duress at 28 Fell View LA2 9RP sorry I have no phone and before I go on I wish to alert you all to the FACT that a strong supporter of mine in Bournemouth is being victimised because of his support of me and punished. That is why former friends and even family know better than to even be seen with me. Read “The Constant Gardener” and there you have it, my case in that novel. Please note that wasted police time in recruiting lowlife has involved at least 20 cars and drivers, plus harassers generally and 2 bent cops to claim they saw a large black BMW where I walked so I had met with the driver when I merely took a photo of that would be fraudster parked hiding to then drive off and pretend, was to pretend that today 1/5/18 is 1/7/13 again when on 1/7/13 I left 298 Oxcliffe Rd LA3 3EJ (scene of attempted murders of me). The documents: The second is an email which was NOT on my Section 7 Subject access file papers when Chris Cox of the MoJ Access Rights Unit handed me file papers. This was sent electronically but was somehow not on records. Nothing real was on record as ALL was bogus. 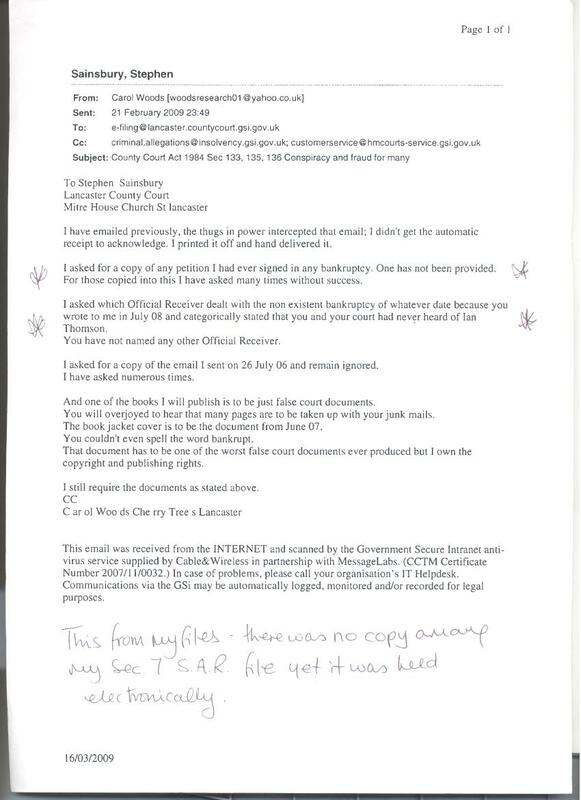 I have already sent (twice) the email that the manager of Lancaster County Court (Stephen Sainsbury) sent to the then Access Rights Unit, after ignoring them for months when they tried to comply with my Sec 7 SAR, that they should send all to him personally and not to the court. This time, a different office and new staff and all Mr Cox had to hand to me were papers with all details of anything and anyone else named tipexed out so that they could not be prosecuted within the EXTORTION, FRAUD, DEMAND MONEY WITH MENACES and so on which I have reported FOR YEARS. I will scan and send some of those asap so all can see what junk I am left to deal with in the wild hopes that I have not managed to hang on to MY files. The INTENTION in seizing and wrecking my house, then looting it in Oct and Nov 08 was to hope I was pushed to “swap” for my files so that I’d get my house back in its wrecked state and the Gestapo would get my files. And then who would believe a word of what I said? Nobody at all. The plan was formed from 2003 and in 2005, in one court farce, (all acting on instruction from Falconer to protect his chum’s wife and her part in my case and the corporate manslaughter in my whistle-blowing) despite the evidence and PROOF of perjury and serious crime nothing was done and the second page shows the case that LCC (Lancashire County Council) entered as “Exhibit” which case was a puzzle to me until I checked on the Internet. The case was of a man cheated out of everything including his files so, while he applied to courts and judges said that if he could prove his bizarre claims it would indeed be shocking, he could not prove his claims as everything had been stolen from him. He died in his early 70’s without any justice at all. I wondered what on earth this was entered for in 2005 when the evidence was overwhelming, it was because they PLANNED it all for 2008. BUT in that Mike Todd GMP saw my file first and was prosecuting which was why he was murdered; he had to be silenced. Thus the email I submit here was not on my MoJ file and we know why: because nothing was; all was bogus and I was not expected to survive to tell the tale. The note made where I asked again for a copy of any petition I had ever signed as per the law if I was made bankrupt can be seen, recently I sent out a REAL document showing that anyone made bankrupt would be given a petition to complete and I asked Cox if he had “forgotten” to add anything I had ever signed in the supposed bankruptcy; he could send nothing. I have asked for years for any such document signed by me; there is no document. I attach one other email that was NOT on the MoJ file and this asks for a copy of anything at all signed by me; it is dated 27 July 2006 and sent from this email address which is mine and mine alone and has been from 2002. Please note that I also asked which Official Receiver dealt with the FRAUD as the court wrote to me stating that they had never heard of IAN THOMSON the OR of that time. None of what I have was offered to me as court copies. 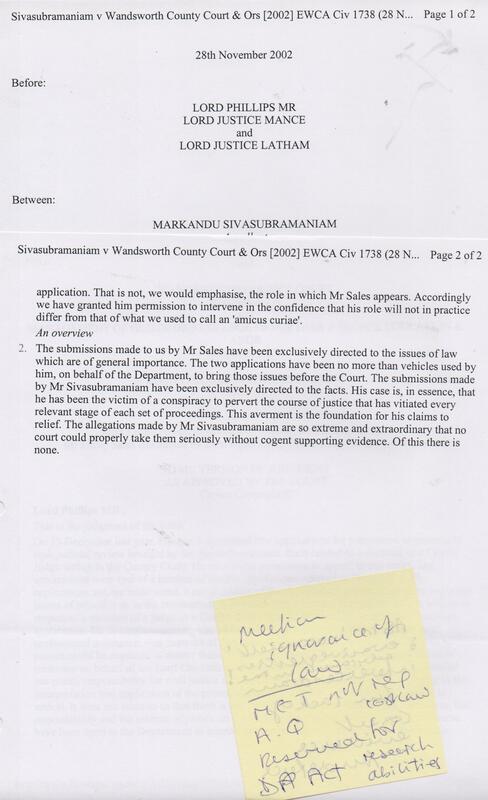 The other item I bring to the attention is my asking at item 2 of my letter dated 18 May 2006 (which was also sent electronically but not on the MoJ files YET IT WAS ON THE POLICE FILES WHEN THE ICO “ENCOURAGED” THEM TO DEAL WITH MY SEC 7 S.A.R. How have the police got it, it was not copied to them?) about a document that had to have existed after a hearing of 2 Feb 2006 which hearing I learned of by chance. (The ‘bearer’ I refer to was a daughter of mine which daughter, by May 2008, was then said to be me, I had become my own daughter, this one; I have 3.) I had also written on 16 May 2006 on that matter as if there is a hearing then there is a document. Sainsbury denied anything had taken place on 2 Feb 2006. 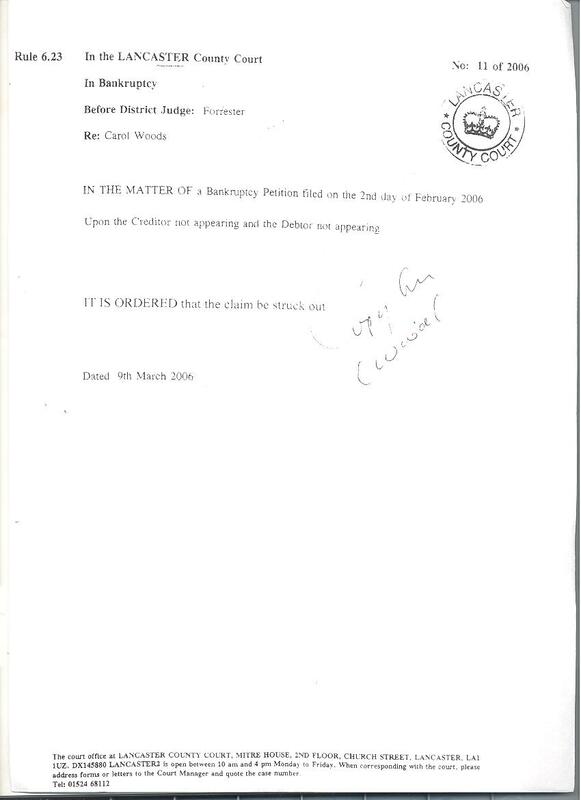 The note on the base of the letter states that no copy of this was on the MoJ file offered to me June 2016, does that explain why Ian Thomson “Official Receiver” of Blackpool had no “bankruptcy order” until Jan 2007? How could he be appointed without an “order”? Even by Jan 2007 the “order” was junk. Mike Todd saw all that and as MY statement said, I would not be the first to be defrauded in this way. Thomson was advised to take early retirement after 2008 events at my house when I caught him stalking me round Lancaster and pretending in the usual Masonic nonsense that “seen where I was” was PROOF he met with me. Later that same day he was parked in his car at MY gate and pretending that was PROOF he was indoors with me which is still done by the same types of fraudsters and bullying thieves. Thomson, like GMP thugs, had sent me emails pretending they were from someone else as if I was an idiot. The last document is yet more junk but at least it is in my favour: it refers to the 2nd Feb 2006 which I KNEW was significant but Sainsbury assured me nothing happened. Someone was trying to help me. This was not on any MoJ file I have been supplied with. Given the insanity in harassment and use of trolls over the last few days AFTER the Gestapo saw this I typed almost ready to send out, makes me think they know EXACTLY what happened on 2/2/06 and I only have some of it. It is attached here. Ends Carol Woods Ms. PLEASE FEEL FREE TO QUOTE ME. Please see this for Lancs lunacy: May 2017 I was attending a conference in Perth and had my photo taken with a male attendee. In that photo I wore a black and white garment. Photos LOOTED from MY house in Nov 08 show me in many black and white garments. The photo was emailed to me later and the Gestapo ILLEGALLY seeing that then arranged for the thief and fraudster who is ONE from SCORES they claim is me, she AGNES JACKSON 26 FELL VIEW LA2 9RP to borrow and hang on her washing line a black and white creation which was to be PROOF she was me in my photo. The dress she borrowed was at least 2 sizes to small for her and about half a metre too long: it was nothing I would wear (this hanging on a line as proof of whatever lunacy is routine) BUT YOU funded the Gestapo helicopter to go over and confirm they saw that on her line thus she was me. I took photos and all that was sent out months ago (drawing not a comment I add so all must love funding thuggery), but on Friday last week JUNE F WILLIAMS in 30 Fell View was to go out in a black and white creation to be me but found out so on Saturday, the Gestapo had OTHERS they want to claim are me and they were told to wear black and white skirts, whatever they had. I had given away my garment months earlier. PAT JACKSON of 8 DeVitre St Lancaster former friend turned thief was ONE of those as Mrs Important and Clever stalking me she in a black and white garment. BUT then these below are also me, I would love to see any one of them in a black and white dress especially my size. The first is a loud mouth “writer” who thinks he’s too good to work so never has done. He writes drivel and shouts it at “open mike nights” when everybody leaves. He is paid to get to Morecambe if I am seen heading there so he seen there is proof he is me. YOU fund that. I have no idea of his name. The photos next is a male bald headed who has been sued for YEARS and was used often at SAINSBURY’s stalking me and pretending he there was link to me with my shopping. 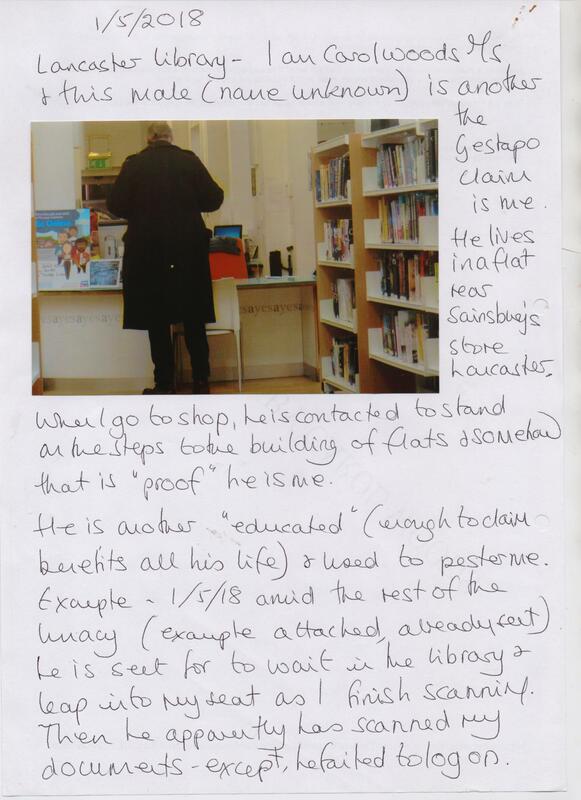 He I found sat in Nero’s cafe opposite the library every single day and hogged the one power point as he used a phone as if linked to me when he saw me enter the library, YOU then bought him a lap top. He only ever had one drink a day but sat there ALL day 7 days a week. I have no idea who he is but he has been sent to be seen at my parked car on the edge of Lancaster and that is PROOF he is also me or linked to me. The older man below may be a nice person but he was recruited some months back and he is paid to get between Morecambe and Lancaster wherever I am and he uses his lap top as he is to be one of the fraudsters of 2012 into 2013. I am to see this male and forget that fraudster of 2012 into 2013 who claimed I was his sister and drove him about. 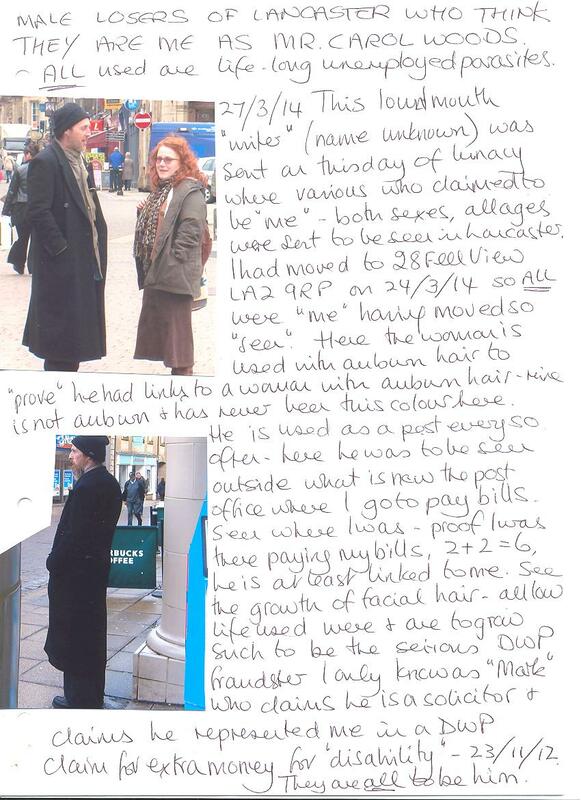 The last is ANOTHER life long unemployed local loser who is also a “writer” and he lives in flats behind Sainsbury’s; his “job” is to stand on the steps of his flat when told to so that when I drive from the store ILLEGAL MONITORING ALLOWS FOR ALL THIS, he seen is apparently me. 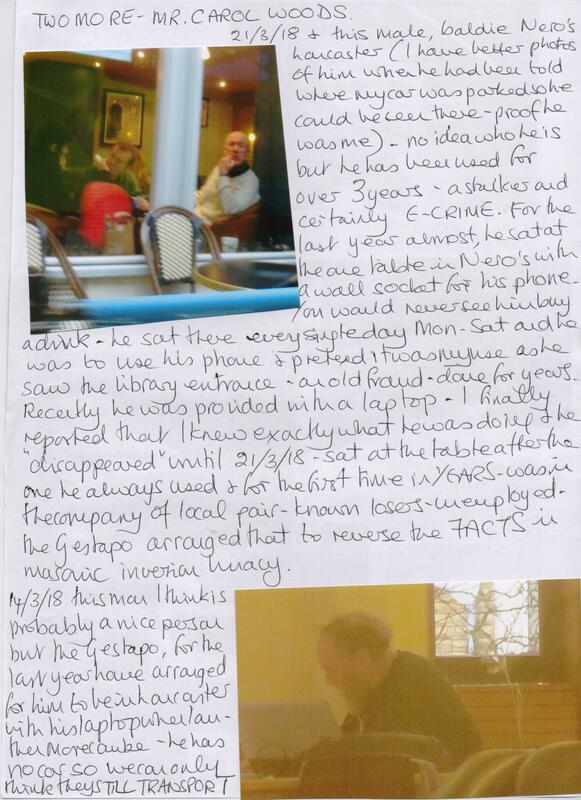 In Lancaster, he is sent to rush from his flat across the town where he sits in the library as on 1/5/18 and then leap into the seat I have just vacated and continue in use of computer and that is to be PROOF he is linked to me and we SHARE a computer! 1/5/18 he failed to do that and had to ask for help while I left the building; he is nothing to do with me. I would like to see any of these in a black and white dress of my size. The lunatics have taken over the asylum. Now we have this INTENT IN E-CRIME COVER UP sent out. Ends Ms Carol Woods sorry I have no phone. 28 Fell View LA2 9RP. SOME who Lancs police claim are me, Ms Carol Woods of 28 Fell View LA2 9RP. There are males who are all me as MR Carol (Carl) Woods but here I record those used often and over YEARS. Naturally the harassment goes without saying. 12/12/17 and a woman in a green “tail” coat was used again after not having been used from early 2015. She was used often when I moved to Fell View in March 2014; she was to be me with DOGS and DISABLED “seen round Fell View” so proof she was me and I was disabled and had a dog or 2. She is only disabled when necessary: I have seen her not too far from Fell View when not in “role” and perfectly able to walk about as normal. I took a photo as she had dyed her hair a “red” to be me when mine is nothing like her ‘red’ and mine is not from a bottle. The DISABLED is to be ME who “lost” MY house as I was “too disabled to live in it” (according to the extortionists, thieves and fraudsters) and using others who pose as “disabled” is proof they are me and thus that was the reason MY HOUSE WAS STOLEN WRECKED AND LOOTED in Oct and Nov 08. Persons in serious fraud and ID THEFT have had dogs thus the Gestapo try to invent me as having one at least. In 2006 the Gestapo told the Investigatory Powers Tribunal that I was not me, that they had never heard of me and that I had never lived in my house or in Lancaster but was my sister living in the OL2 area nearer to Manchester. No one asked the Gestapo how they knew I had a sister and where she lived if they had never heard of me. The electoral registers on public publications now from 2006 show ME in MY house and alone. But since then, anyone is and everyone are me, anyone I ever worked with or knew even as acquaintance, anyone I become friendly with, anyone I rent with which was how JANICE BOURNEN landlady of 2011 7 North Way Lewes was aided and abetted in TREASON and FORGERY to be me then. Later, in 2011 I stayed at my sister’s and had a shirt which had a shaped back; my sister liked the shirt and expressed her liking adding that the back of the shirt was unusual in being like a fish tail shape. ILLEGALLY heard, the Gestapo then set about using those with these jackets as my shirt was unusual; I disposed of it when I found the mostly lowlife sent to stand in front of me and show me they had a fish tail jacket/coat as the “disabled” fraudster above. While at my sister’s, the Gestapo used her daughters and her grand-daughters all to take a “role” and thus, by end of 2011, I was 16 years old again. Much of that involved use of social media as if it was my use and my sister’s family so unintelligent thought it was fun and exciting. But when I am not in UK, how can it even be pretended she is me? Croatia, Oct 2017 and I found one following me about: a lookalike of her to be proof she as above is really me and was seen in Dubrovnik. MANY said to be me are sent to be seen near MY house as PROOF and also, sent to stand about by my car and pretend that is also proof they are me. Many photos for real enquiries. The art tutor was though not “me” when I was in Barcelona 2015; that was then the “turn” of Hicks and McHarran 43 Fell View (the couple to be seen as them where I was, was about 20 years too young to be the thieves from 43), Hunter from 22 types were to hide in a doorway and step out to then walk as if with me as if I was there with Hunter thieves and fraudsters, BUT there was also a pair of local women used to follow me on the Metro and they with dyed, almost orange hair and in RED were to be me as WILLIAMS the murderous thief in 30 Fell View who is also apparently me. Anywhere I go, the Gestapo find persons they think could be said to be lowlife from Caton and thus are me or are with me to cover for the serious fraudsters and thieves and much worse. THIS IS FREEMASON LED AND THUS WORLD WIDE. THE FACT THAT MY WHISTLE-BLOWING IN 2001 STOPPED THEM GETTING THE SUPER CASINO IS AT THE ROOT OF THIS. When I rented caravan 1A at 298 Oxcliffe Rd LA3 3EJ from 4/3/12 – 1/7/13, 3A was then used by an Alan McTear and his partner Evelyn- she claimed to be me and they applied for DWP monies as if she was me; he, the partner, needing extra monies for her (my) “illness”. The landlady Mrs Margaret Middleton was me as my dead mother and that involved a DWP fraud all reported, all ignored. Had my mother been alive, she would have been about Mrs Middleton’s age. Caravan 1 was a Stuart William Rogers who then became Steve and then Dave moving when found out from caravan 1 to caravan 5 vacated by yet another who claimed to be my brother. Rogers had been claiming to be my carer and driver as my brother using MY car. Martin Brankin aka as N Rankin using caravan 5 was also apparently my brother but I drove him about in the car used in theft and fraud PJ60 BYR. Brankin never lived at 298 but pretended to for his second home and added names for purposes of fraud. Only Rogers and Nichol ever lived at 298 when I did. Caravan 3A was also used by yet another supposed relative of mine, a Vicky McQuaid and her partner Steve Williams. She claimed to be my daughter, a pair of druggies and thieves and just what the Gestapo wanted. They really lived in Morecambe proper as well and only used 3A for fraud. BUT a Diane Lennon also apparently lived in caravan 3A and she was me “disabled” and claimed to DVLA and REMPLOY as if she was me. She “ran away” 11 Aug 2012 found out and took MY mail with her. Her car X486 DDC blue Citroen. Caravan 3 was a male in hiding who all claimed was not there; he was me as MR Carol Woods and E-CRIME etc is part of that. To cover for him a MARK A RIDING would call and he was chosen to look similar to Mr Invisible so that I would be confused as to who was there and who was not; they think I am stupid. Mark A Riding became S Riding the day my brother’s wallet was stolen from his jacket in his place of work. He Riding was ANOTHER to claim to be my brother. In caravan 2 the KENNETH NICHOL did live aka various others and he claimed to be my partner as the drunk driver and lowlife he was. No 4 at 298 was an old stable, it had no power, no water and no cooking at all, a THOMAS/TERENCE GATENBY/GATEBY pretended to rent there and he still does. Someone pays him in fraud as he really lives in a flat in Morecambe. He was linked to me as if ANOTHER “partner” and I suggest that was because he had lots of gambling debts which the Gestapo wanted to say were mine and why I “lost” MY HOUSE in 08. I then moved to Flat 3 Penhale Gardens LA3 2QA about 3 miles away and found many waiting to be ‘me’. BUT HARASSMENT AND LUNACY OF NOW AND THE GESTAPO ARE PRETENDING THAT I HAVE JUST MOVED FROM 298 AS THIS IS NOT 1/5/18 AS WE ALL THINK BUT IS REALLY 1/7/13 AGAIN. THE USUAL SLEAZY COUNCIL HIDE IN CARS ROUND FELL VIEW AND PRETEND TO “HELP ME” E.G. AF59 ZNL HIDING AT 36 AND 38 FELL VIEW; PAID FOR IN EMBEZZLEMENT OF PUBLIC FUNDS BY THE ELECTORATE OF COURSE. Flat 2 SYBIL WESTWELL took over from Mrs M Middleton as my dead mother but as if my dead mother was me , so too did Flat 7 tenant Bessie Robinson and Flat 8 Betty Frobisher. Flat 4 was Shirley Rycroft nasty piece of work and she was ‘me’ and tried to sell MY HOUSE TWICE, once 29 Aug 2013 with the usual sleazy solicitor and council aiding and abetting and then again 4/2/14 via an old thief in Flat 15 Edith Curwen who posed as my dead mother with Rycroft as me, the daughter, that too was to sell MY house. In Flat 5 was an old parasite who the Gestapo gave ID to as if she was me learning to drive. They even sent her to take lessons from 298 and pretended I had never left there at all. The LOOTING OF THE DEAD and worse was uncovered by me while I rented there. The former tenant of Flat 3, a Mrs M Porter was said to be my mother so that I was not me and others could be. The car involved was YK02 VPF as significant in this as PJ60 BYR. Even after I left the flat, Rycroft was used to be me and when she was not used, the usual lookalikes were used. Rycroft and the fraudster from Flat 5 appeared in at least one court as my sister and me. Flat 9 lunatics were a male with a sister who called daily thus the reversal of 298 with the brother being driven about and cared for instead of me. The BRANKIN fraud was being revised. He from Flat 9 did then go to live with her and that was me moving in with my brother apparently. Flat 10 a seedy old couple were moved in, Carole and Peter Fairburn, she was to be me. She would go out in a taxi as ME and he would drive round in the car the tax-payer bought for them PJ11 PPX, and pretend I was in that car as Mrs! Flat 11 was a coarse old woman but she did have a “C” name thus “proof” she was me, CHRISTINE and, daughter where no one else in 23 other flats from 24 had anyone at all; they were provided with bogus relatives to try and make them me with my family. Flat 12 James McNamara, I think retired estate agent, and he would use taxis to follow me and try to be seen where I was as proof he was linked to me: he was to be the McTEAR, McQUAID name “revised”. Others it took me a while to find out why they were used, it was manic all day every day, lots to cover up from them all. No 13 I found was a LENNON so she was used to be LENNON used at 298, Flat 15 was an EDITH CURWEN and she posed as me as if I was my DEAD mother with RYCROFT posing as “daughter” (me) on 4/2/14 AT LEAST trying to sell MY HOUSE. WOODS in 18 was a retired cop and his wife PATRICIA was to be the Patricia ALLEN the Gestapo so want to make me be with then Patricia WOODS making ME the perjurer and worse Pat Allen from my whistle-blowing time 2001. He was used end Dec 2017 AGAIN as a stalker and pretends whatever his delusions allow. I will not go into the others making up the 24 flats (23 plus flat 3, mine). Then I moved to 28 Fell View and apparently move in at least 5 times every week and have done so while typing this, apparently. I had more of the same: Mary Lamb in 32 was the “my dead mother” routine, 34 Blenkinship was a “3 some” with a Heather as the 3rd then she became “Laura” but they were me apparently. I found that at least 24 claimed that I lived with them and they ALL had at least 2 decent vehicles and FREE MONEY which is why no one worked. BUT I then discover that those found out in 20, 22, 14, 41 etc who claimed I lived with them as driven about and cared for such, that they ALL then became me and such as MILLS in 20, the pretence in lunacy was that “she” as “me” was dropped off at 20 at least 3 times in the week to 27/4/18. In this, the Gestapo alter the electoral register so M Lamb becomes in 2017 MARALYN REID and REID in 49 become MOSS, MILLS in 20 become STAIG and I move into no. 11 Fell View at least twice a week as STAIG do live there and the Gestapo want me to be the thief MILLS so, if they try hard enough, the assume they can make me seem to be in 11 Fell View and somehow, having given MILLS a false ID to avoid charges of fraud and worse does make her into me thus not liable for her thefts, frauds and E-Crime. 2 Fell View is a rough, younger troll WOODRUFF and she was used in E-CRIME to be my daughter and used for over 4 years also linking herself to 45 Fell View DALTON where Mrs Margaret Dalton claimed to be me but had no daughter so used Woodruff to be the daughter as “proof” she Dalton was me. E-CRIME went on from 45 seriously for at least 4 years until I found it all out and then the Gestapo called to aid and abet and falsify a witness statement claiming DALTON were in Tenerife from 5 Oct 2015 and I was on Fell View when I was in Barcelona and that lowlife have been nowhere mainly as they have no passports. The son, a yob, and both are long term unemployed but she driven about to be me as she does not drive and I do. Y211 AAO was used to end 2015 when all found out again and a great “all change” took place. DALTON is a name from my case 2402412/04 against LCC so they reuse the names and hope I forget where I know them from originally. 12 Fell View is a rough unemployed pair ELY and he was recruited as a witness in MY case 2402412/04 was Stanley ELY so his name was “revised” and I apparently lived with that pair in their self-made slum. 14 is McGuire and Stroud and she is apparently my daughter and I also live there being driven about by her which is why she does not have to have a job. Nor does he; another pair of parasites paid to pretend. She is the Caton version of McTear. McQuaid, McNamara. And they are all to hope I forget the WREA GREEN LAND REGISTRY FRAUDSTER CAROLE McATEER. 18 is apparently my sister as the woman in 18 is Marjorie so ‘proof’ she drives me about and is my sister when my sister does not drive nor is she called HODGSON as she in 18 Fell View is. MILLS aka STAIG in 20 and she is apparently my niece and I live there in a squalid caravan dumped on the front of 20 by the council and Gestapo to aid and abet serious fraud at least. See above as to how she is “protected” by then being “me”. 22 Fell View is HUNTER and I also live there as his mother. BUT then they decided I was her mother then they decided she was me. A car FE11 OBN has been used often to pretend to drive me from somewhere else o move into 22: photos show I have moved in at least 30 times and one week, “I” moved in 5 times that week alone. 24 Fell View is CURWEN and I apparently am Mrs Lena Curwen and live there paying him with £50.000.00 monies stolen from me. 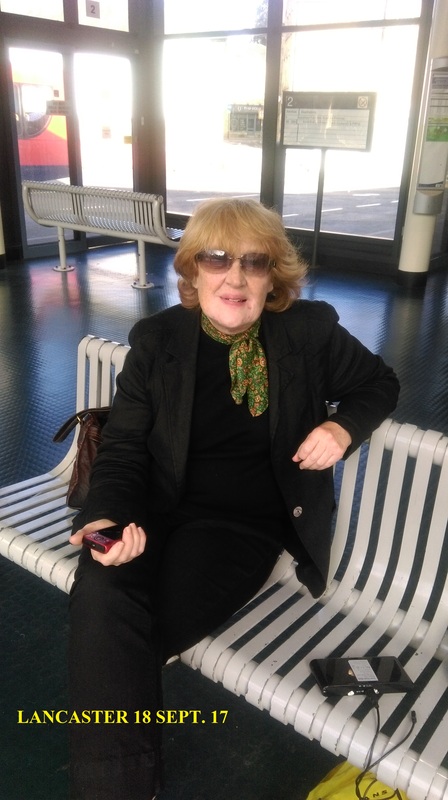 26 is AGNES JACKSON major player in fraud and ID THEFT she who attended a GP as if she was me 9/9/14 with PCSO PETER WOOD sent to keep me talking indoors so that I could not go out and spoil that FRAUD. On 5/6/7 July 2014 she had admitted herself into a local mental hospital as if she was me (they all knew she was not) and on 26/12/14 she rang NHS mental services saying she was me depressed, they knew again I had not called but arrived to march along and PRETEND. Jackson pretended 2 persons lived in 26 and that one was her identical twin Carol Woods; she was loaned yobs with “ginger hair” as PROOF she was me and they were all MR C Woods. The “identical twin” routine goes on so now she has at least 5 FIVE “identical twins” the latest one used on 26/4/18. 30 Fell View is Mr and Mrs June and Kinglsey Williams, nasty pieces of work, she inebriate and bankrupt who is also me with police provided ID to aid and abet PLUS a “volunteer’s job” in HMYOI Lancaster Farms given my qualified teacher status, she has no qualifications at all and is semi -literate. They have had 5 FIVE cars and SKY TV in my name he claims to be Mr CARL WOODS. 32 Fell View as above (my dead mother) and 34 as above (I am one of a “3 some”) BLENKINSHIP more unemployed roughnecks who act on instruction and I also live there, apparently. 36 is JACKSON unemployed yob who was used by Jackson in 26 in DWP fraud where he pretended to contact me via text (by standing outside me) and then shaving his head and meeting Agnes Jackson in Lancaster posing as her son as MR C Woods to aid her to be me. They are not related. 38 was Stephen and Christine MILLS related to MILLS in 20 Fell View but then became David and Rebecca Wood without any visible signs of moving in or out; that was the great ALL CHANGE end 2015. 42 is used by a GARY O’KEEFEE stalker who pretends to drive about and I guess is far more involved than I know. He “replaces” ROGERS from 298, ALL are “replacements” of others already used. 11 is or was STAIG, a “3 some” where I appear to move in and out regularly but see link to fraudsters in 20 for motive. 17 is JOANNE NOLAN and she is apparently my daughter and in that the Gestapo claim she is Joanne Hall a niece of mine they want to say is me and HALL, daughter of my sister, then suggests that Hall is my daughter thus Nolan being Hall is apparently proof I am in 17 Fell View! I often move into 17 via taxi yet oddly she is the only one ever on the electoral register. 23 Fell View Clarke and I apparently live there as “disabled” as he is my brother and carer – apparently. 29 Fell View was LENNON to be LENNON from above (298 and Flat 13) and found out in her fraud was told to change her name to SLATER. Apparently I also lived there. JANE SLATER she became with her hair dyed “red” and in Lancaster the Gestapo use a former cole4laguie of mine JANE UPTON told to dye her hair a “red” as she is me when Slater is not near me. 31 is a flop house used by many who come and go. All the males there are Mr Carol Woods apparently. A woman who seems to be in charge, rough, foul mouthed, dyes her grey hair the browny red” and parades in front on 28 with whichever idiot male is Mr CW and she claims it is proof she is me. 33 is unoccupied and has been for 4 years yet the council send sleazy and the Gestapo send their old doxies and fraudsters to park and pretend they meet with the occupant who is apparently me, the MISSING elderly lady is MARGARET PECK. The lunatics act out persons moving into 33 often and to date I have counted 1021 persons, all invisible, have moved into 33 Fell View. It is ANOTHER address for me to move to as “disabled”. 37 was a Malaysian troll who claimed I was her mother living there; found out end Feb 2015, she was moved literally overnight. Since when sleazy council used it for computer crime and STILL use it as a flop house for same. 39 Mr and Mrs O’Conner she ANGELA and she is also me as her identical twin and a second address. 41 Is Suzanne and Andrew Jarvis and I apparently moved in with them 24/4/14 then 24/4/14 and so on yet in 2015 they were me as Mr and Mrs C Woods she with a cleaner’s job at Lancaster University as if she was me, and they STILL use phones and computers as if it is my use. March 22nd 2018 and he hid outside me in 28 after sneaking through my front garden to use his phone late at night and pretend that as it was NEAR me in 28 then it must be MY use. 43 Fell View is Maureen McHarran and she is also me, apparently, serious E-CRIME works with Jarvis from time to time and a SAINSBURY on-line fraud found out. 43 is MAUREEN McHARRAN and PAUL HICKS, he to be PAUL HITCHMAN from Lewes 2011 again and she to be me as Maureen Hefferen who could show that ONE perjurer was just that Gillian ARMSTRONG of LCC. I am to forget M Hefferen. This is a classic example of how I am to be every single person I ever knew or worked with. E-Crime Sainsbury FRAUDS. 45 is MARGARET DALTON life- long unemployed, another and son ditto TRAVIS and she is also apparently me. That was a JOYCE DALTON LCC perjurer and ANOTHER to be said to be me so the lowlife in 45 was used with her name DALTON but she also claims she is Wheatfield. She is driven about by a yob in DE61 DBO to be seen in a red car as proof she is me. While I rented Flat 3 LA3 2QA the Gestapo used SUZANNE HARGREAVES former good friend of mine to take taxis as me. She does not drive. They also provided her with a DRIVER to take her to KENDAL when they saw I headed there so that she could pretend as she was in Kendal that she was me. Her address was 58 Knowles Rd Heysham; it may still be. I have not checked. Claire, of the couple Ian and Claire Eccles, former DWP staff corrupt who she went to take a menial job with LCC so she could seem to be me and they lottery winners, I was harassed for over 2 years to hope I thought I had had a lottery win and thus she was me. He left DWP after they had to “run away” as found out and went to NHS “records” dept. Neither has any qualifications and they have not had any children. My daughter-in-law Claire given a post with LCC and said to be me as she is C Woods of course married to my son. Diana Garner was moved to DORSET and thus she was me having sold my house to live in Dorset. Patricia Jackson of 8 DeVitre St Lancaster another long standing friend “suddenly came into money” in 2012 and end Dec 2010 those 2 stole 2 USB’s of data from me so they could say it was their data thus they were me. Jackson is not related to Jackson in 26 Fell View and now P Jackson has been given another name for the electoral register to hide her fraud and ID THEFT like MILLS in 20 Fell View. Tina Pazzano, now of Patna Ayr, was bribed to “forget” with a mortgage paid off although I never heard that she received any payment. I have been said to be Asian, a lady I am friendly with and Jamaican, a former good friend who was sent as a quisling in 2016 so I never met up with her again. My former sister in law, JANET GREENWOOD was used from Dec 2010 to RECENT as she kept our family name when our brother divorced her years ago. She lives in 37 Norfolk Ave Morecambe and that was why the thief in 37 Fell View was recruited to use. The 2 were to become “confused” as to who was who over time. JANET WOODALL 11 SULLOM VIEW GARSTANG NR PRESTON LANCS SERIOUS FRAUDSTER WHO APPEARED IN COURTS AS ME ESPECIALLY 19 APRIL 2006 AND FALSE FRIEND SENT END 2005 AND NOT FOUND OUT BY ME UNTIL LATE 09. I HAD NO IDEA WHAT A “FALSE FRIEND” WAS. WOODALL RECRUITED TRACEY KENNEDY POLICE OFFICER AND LESBIAN VIA THOSE CIRCLES AND ANNA JUDITH PERELES BOTH OF WHOM HAVE POSED AS ME IN COURTS – PLURAL. GAIL CAPSTICK, 57 Ingleborough Rd Lancaster friend of over 35 years used to be me and to steal my house title deeds to save her own neck from prosecution for false accounting. Males think they can tell me of their experiences which are always nonsense but that apparently makes them me as MR Carol Woods. It goes on but this is enough for any jury. I wait to testify and we can see which of the bullying liars and thieves arrives to stand as me and with MY documents obviously. Patricia Allen “manager” LCC Social Services who has always lived in Preston is apparently me, she with her false CV and claims to qualifications that do not exist thus she is to be me and I am to be her! She is married to a used car dealer JOHN. Thus LYNNE AUSTIN of 14 Linfield Terrace Blackpool is used as she is married to a “John” and as she lives near enough to an airport is to be me as I was arrested for following someone to a local airport when we do not have one thus Lynne took on the role as me except she was not arrested nor does she drive. Patricia Morley of The Old Coach House Bath Mill Lane Lancaster is also me as she is married to Dave and they were friends of mine (ours when I was married) for many years. The Gestapo use sleazy gormless to park and hide on Bath Mill Lane when I park not too far away and they hope I don’t see the sleazy in their cars pretending they have dropped me off, but I do and take photos. Pat Morley is poorly qualified but they are REAL, and the ‘DAVE’ is also used to be the murderous lowlife as above at 298 Oxcliffe Rd except that lowlife was not married AND Pat Morley is to be me as PAT ALLEN. BUT ANOTHER “DAVID” is used, David Jackson of 28 Regent St Lancaster and he a stalker for years and former colleague is a bloated, white haired old fool type used so that when he stalks me (example 26/4/18) he then is said to be “seen with me” thus the same type in 30 Fell View, Mr KINGSLEY WILLIAMS aka MR CARL WOODS then out with his wife MRS JUNE WILLIAMS who is aka Carol Woods seems somehow to be FACT that those in 30 Fell View really are me. DAVID JACKSON is married to a woman called SUSAN, a nasty piece of work, hardly ever to be seen with her; I have never known her to work. The JACKSON surname of DAVID and SUSAN 28 REGENT ST Lancaster was another nail in the coffin of Mrs GRENBANK in 28 Fell View when the powers that be decided 28 was wanted for me. JACKSON of PATRICIA JACKSON already used of 8 DeVitre St Lancaster (no relation to any other of the name, Jackson is a local common name) and AGNES JACKSON of 26 Fell View plus David JACKSON and his wife* all have ME as the “common denominator”. *MR and Mrs D Jackson have something of a fraud going linked to me in LLOYDS bank. Agnes Jackson was to take that over as if she was me. In regard to JUNE FRANCIS WILLIAMS in 30 Fell View and the lowlife in 34 JUNE BLENKINSHIP who all pretend links to me, there is also a JUNE GIBSON in 17 Leslie Ave (see above and how I already live in no. 7 and no 17 Fell View) “disabled” and is driven about in B6 ROV van which is close to officer ANDREW HALLIDAY’s licence plate: he of May 2008 who claimed to have bought my house by standing outside while his van was parked his van BV06 and theirs B6 ROV and wasters muddied, or are they? NO. Anyone with a C or K name is apparently me and ALL used as harassers and stalkers. (FULL DETAILS FOR ANY INQUIRY.) Jackie HUNTER of 34 Buckley St near my sister’s house is a thief and fraudster gaining £50.000.00 as if she was me in 2010. HUNTER yet another told to dye her grey hair the “auburn” or similar shade as “proof” she was/is me and she is why HUNTER in 22 Fell View are and were used; apparently I was Mrs J Hunter of Shaw OL2 moving to 22 Fell View except she in Shaw has never left. Nor does she have a married son. BUT she is also why various I know as acquaintances to be JACKIE are also used. The latest lunacy included Agnes Jackson being handed a greetings card on 29/4/18 by a total stranger sent to be ME. The woman had dyed reddy brown hair and drove a large vehicle wearing a red jacket which was apparently PROOF she was me with MY RED CAR. I always know that they are strangers as they always have to ask Jackson if she is who they have been sent to. Why was Jackson handed a card? It is the birthday of LESLEY MARSDEN of BIDEFORD North DEVON a long standing former friend turned into a lunatic and liar and thief if possible when she invited me to stay with them. She is married to DAVID MARSDEN and her “deal” was theft of crucial documents from me and for that she would get a PASSPORT for her wayward son TONY HALLIWELL in hiding in Singapore after he fled Dubai in a sham marriage found out and wanted by the Dubai authorities. Lesley failed to steal my documents, the Gestapo try to “rewrite” all details such as that into their lunacy and thus hope I am “brainwashed” into thinking it is ALL now. Ends for now, all reasonable questions answered and photos supplied if necessary. Carol Woods Ms. Imagine how much is spent organising all this. Sirs I report that a troll using the car AF59 ZNL a VW bluey grey was hiding parked at 36/38 Fell View LA2 9RP today and sat waiting PAID AT PUBLIC EXPENSE TO WAIT AND DRIVE OFF WHEN (IF) I DID AND PRETEND THAT I WAS LINKED TO THE LOWLIFE IN 36 AND 38 FELL VIEW LA2 9RP. The motive was to rewrite the FRAUD and ID THEFT of May 22nd 2015 when the unemployed by profession, parasite and lout JACKSON from 36 Fell View was to stand outside me in 28 Fell View and pretend he communicated with me via text. The lunacy of pretending in use of other trolls and vehicles in the farcical “subliminal messaging” and “brainwashing” that I only moved from 298 Oxcliffe Rd LA3 3EJ today and had not then moved from there 1/7/13 was more than pathetic; it is thuggery. On 22 May 2015 that lout was to then attend a DWP medical with AGNES JACKSON of 26 Fell View who claimed for almost 4 years to be me and he to meet her in Lancaster as if she was me and he was her son as he posed as MR C Woods to make her me as Ms C Woods. She was driven by Y191 SLF (from 31 Fell View) and he to travel by bus and hope I did not find out what was taking place but I did and went to get photos. He had to shave his dark hair as no son of mine would have such dark hair (nor is my son unemployed and never has been) but Jackson in 26 who wants to stop “playing” (the games of fraud etc) now is to be covered for in the lunacy of pretending that had not happened. The lout has been sent to pester me every evening recently and stand about so I see him and think he is linked to me. he is deranged and deluded as well as a professional parasite. Why is that lout NOT forced to seek work? Agnes Jackson in 26 Fell View is not related; the name was to be used in the FRAUD and worse plus ID THEFT planned and premeditated for when I moved to rent 28 Fell View LA2 9RP and had been another nail in the coffin of the elderly lone lady in 28 when YOU decided it was wanted for me so that ALL PLANNED could take place. It was expected that I would not find out! I moved there 24/3/14. This also to DWP FRAUD dept for when it is ALL exposed. From carol Woods Ms under duress at 28 Fell View LA2 9RP.